HACKETTSTOWN, N.J., Nov. 27, 2018 /PRNewswire/ — The New Year will bring a new line-up of silky smooth DOVE® Chocolate Bars in tantalizing flavor combinations inspired by the latest culinary trends. 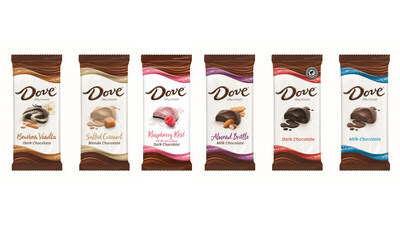 Offering distinct innovation and assorted varieties to tempt the most sophisticated palates, DOVE® Chocolate Bars will feature six bold flavors meant to share or savor all on your own. Bourbon Vanilla Dark Chocolate – Premium bourbon vanilla swirled throughout silky smooth DOVE® Dark Chocolate. Salted Caramel Blonde Chocolate – A delicious blend of White and Milk DOVE® Chocolate featuring sweet caramel notes and a hint of sea salt. Raspberry Rosé Dark Chocolate – A sweet pink layer with raspberry and rosé over silky smooth DOVE® Dark Chocolate. Almond Brittle Milk Chocolate – Rich, buttery toffee and almond pieces in silky smooth DOVE® Milk Chocolate.